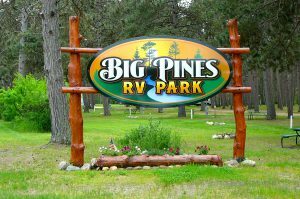 Big Pines RV Resort is a scenic RV Park in Park Rapids, Minnesota along the banks of the scenic Fish Hook River. This is truly a camper’s dream come true! Quiet, secluded RV sites, each with full hook-ups, are set amongst a towering Norway pine forest. Enjoy excellent fishing, swimming, canoeing and kayaking on the sandy, crystal clear waters of the Fish Hook River. Take in the beautiful natural surroundings with a riverside picnic or scenic hike in the woods. Or simply relax around the campfire or in our newly remodeled clubhouse and game room. From biking along the scenic Heartland Trail, to taking in the quaint town of Park Rapids, to discovering the numerous lakes the area has to offer, Big Pines Resort has the ideal northern Minnesota location. 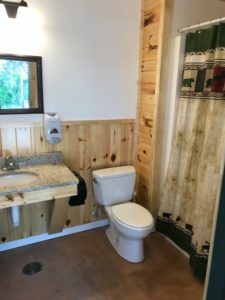 It offers the tranquility of being up north and yet is conveniently located within the city limits of Park Rapids close to all area attractions, shopping, lakes, and golf courses. Plus, if you don’t feel like cooking, the best restaurants in Park Rapids are just a few blocks away! New bathrooms – individual, private, and spectacular! We have exciting new upgrades including new, private, single-occupant bathrooms that are the nicest of any campground in Minnesota. Come for the camping and pamper yourself a little, too! We also have new, wooded campsites with full hook-ups, cable tv (for seasonal rentals only) and internet!